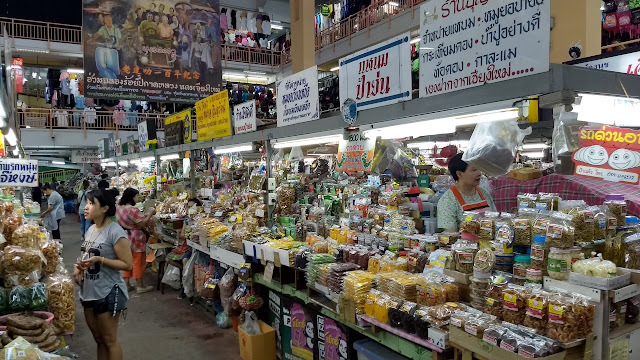 We visited a couple of markets during our stay in Chiang Mai. 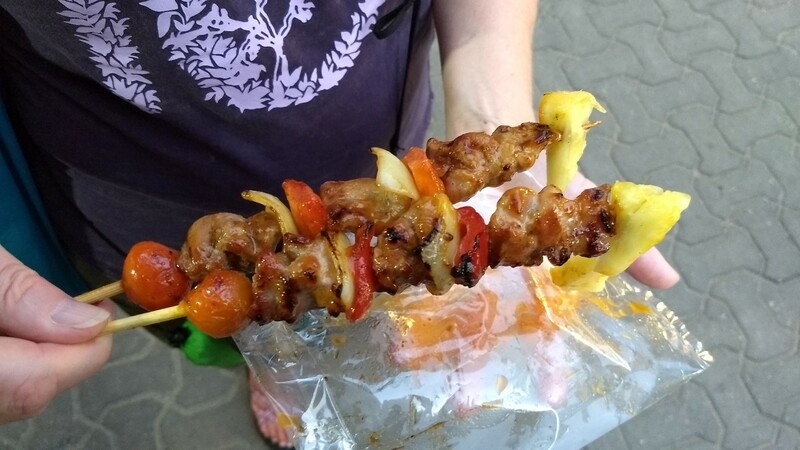 First up was Warorot Market - just a short walk east of the old city. 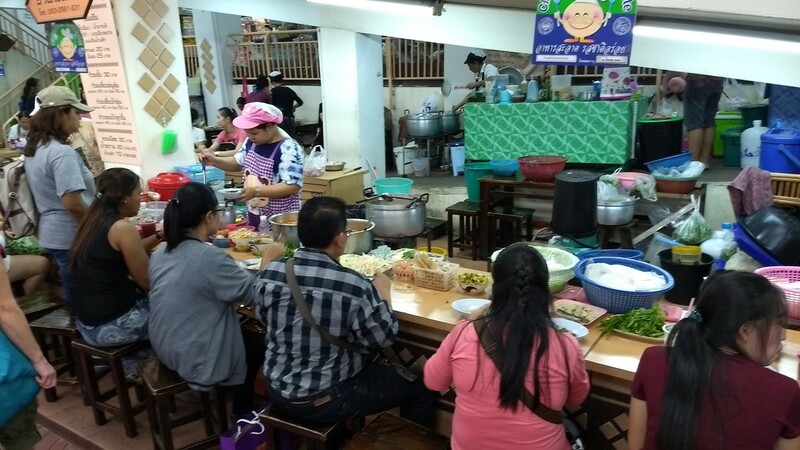 Our primary focus, however, was on looking for the food court so we could have some lunch. 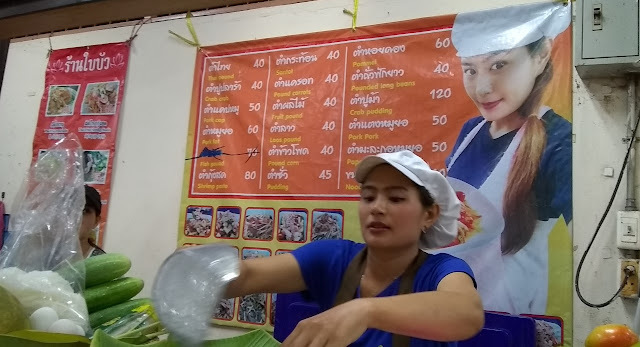 It was hard to resist this friendly lady working in front of a giant picture of herself. The salad was very tasty, with lots of chunks of some kind of pork sausage. She also didn't hold back on the chili level, which we appreciated (she held up a chili as a question, and we gave her an enthusiastic thumbs-up). 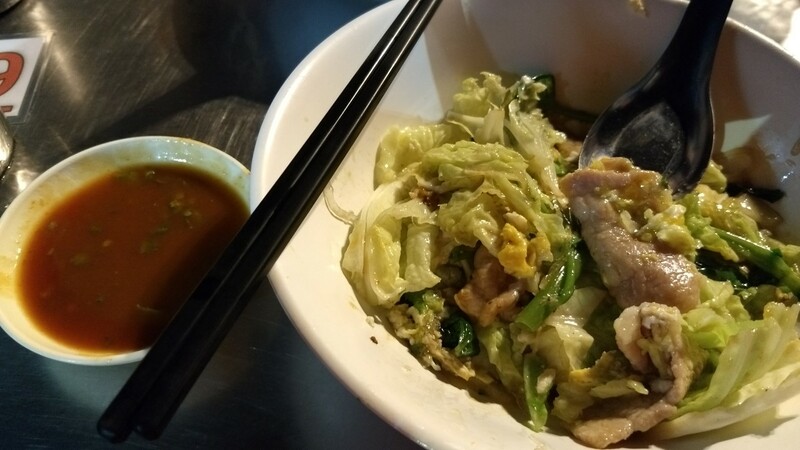 Described as a "spicy lemon noodle with pork", this dish was not very spicy. 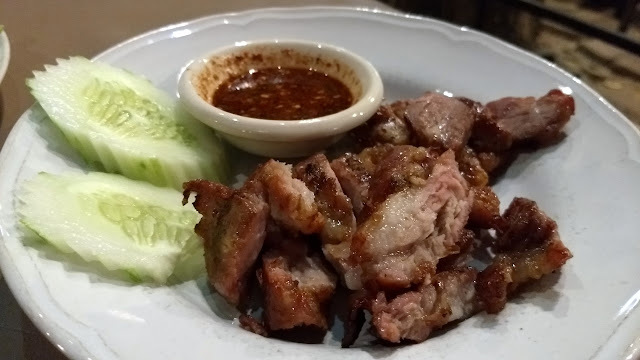 It was delicious, however, and different from anything we'd had before - minced pork, sliced pork, pork balls and some crackling. 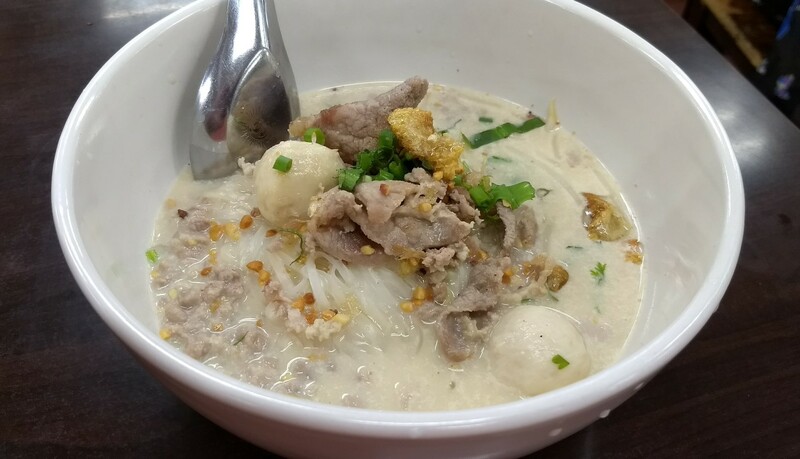 The broth had a nice combination of creamy sweetness from coconut milk and bright acidity from the lemon. 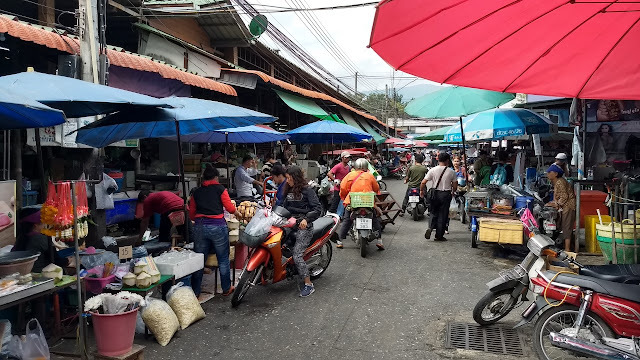 Another day we were walking in the same area, but a bit farther north and came across the Muang Mai Market. 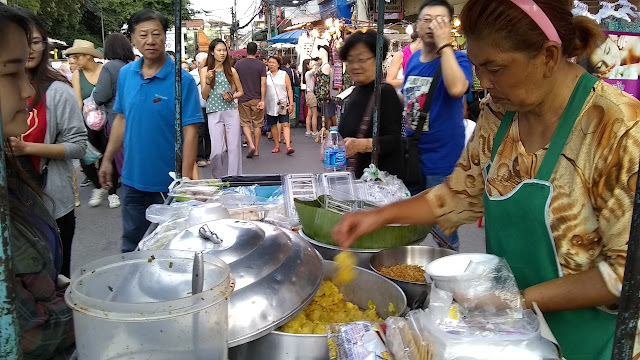 The market was quite large - sprawling across multiple blocks. 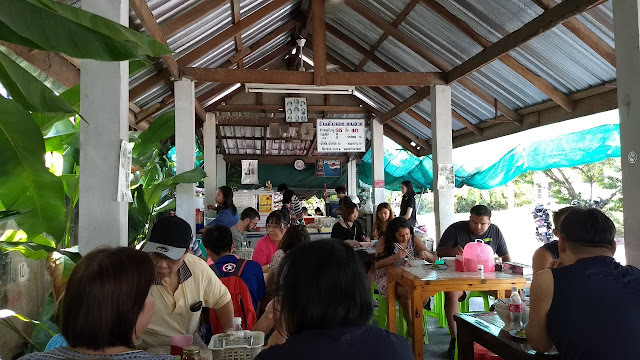 We were there in late morning, so a lot of stuff had already packed up, but there was still a lot going on. 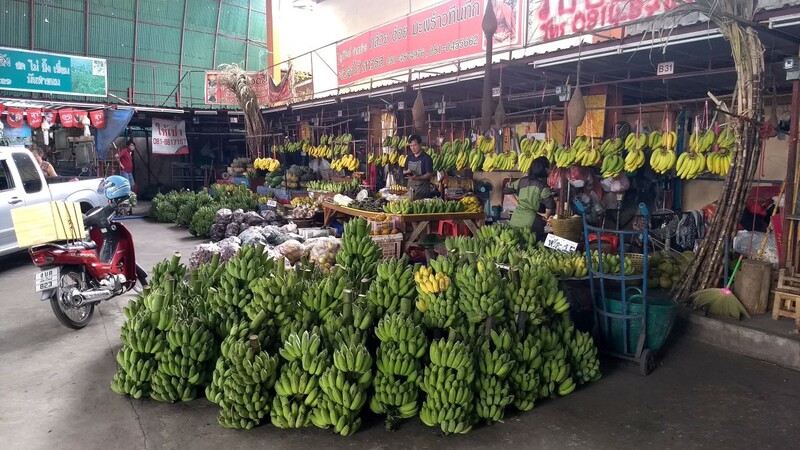 It would be amazing to spend more time in a place like this and be able to shop for cooking ingredients. On this visit, however, we had to make do with feasting with our eyes. 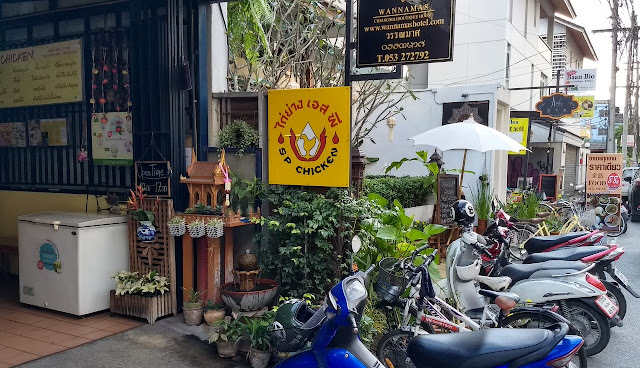 We were lucky we weren't any later, as we got their last chicken. People who came in just after us left disappointed. 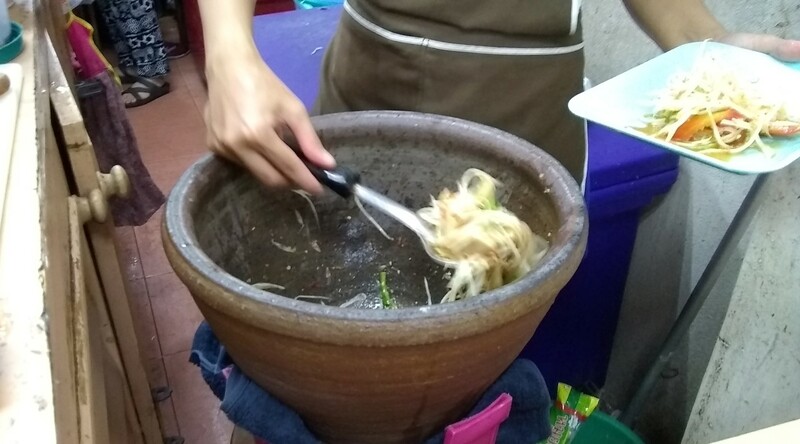 There wasn't anything really wrong with our meal, but we were underwhelmed. The chicken was tasty enough, but didn't live up to our high expectations. We didn't get a chance to try it anywhere else, but hopefully there are better options in Chiang Mai. 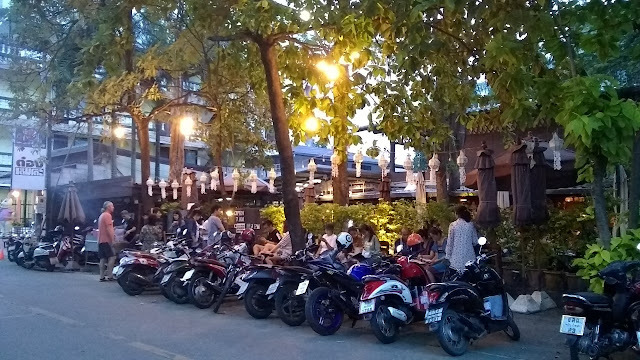 One evening in Chiang Mai we ventured a bit outside of our normal old city stomping grounds to the Nimman district. 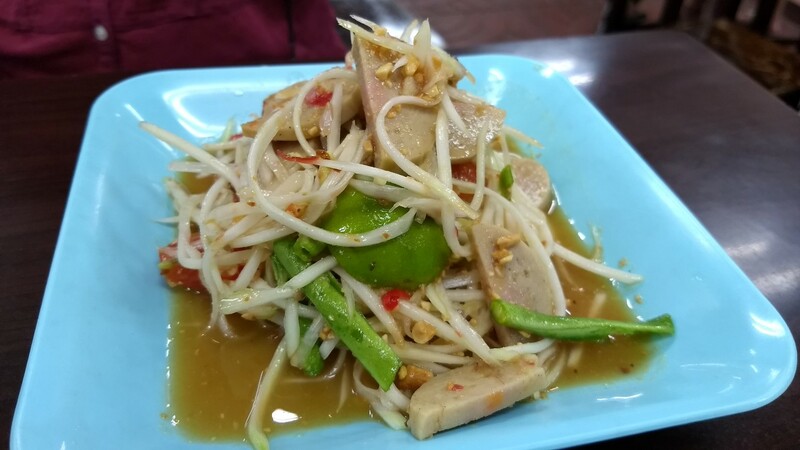 The reason was to have dinner at Tong Tem Toh, a restaurant that specializes in Northern Thai food. 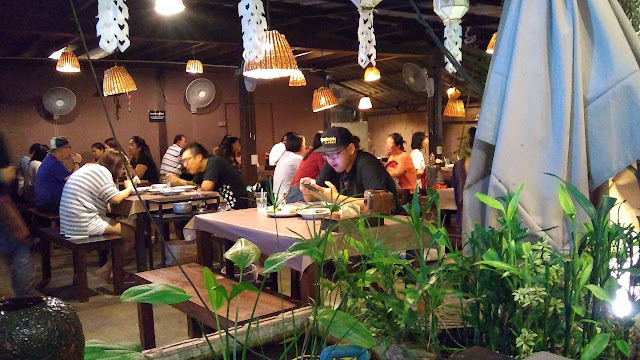 The setting was very nice, and the place was busy - which gave us a chance to peruse the menu as we waited for a table. In the center are two bowls of Nam Prik - Thai chili dip. 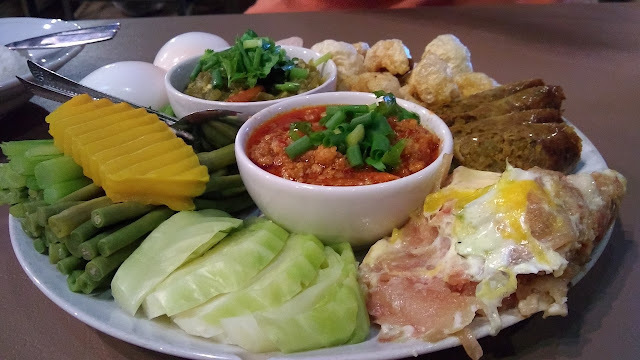 The one in front is Nam Prik Ong - made with minced pork, tomato and chili. 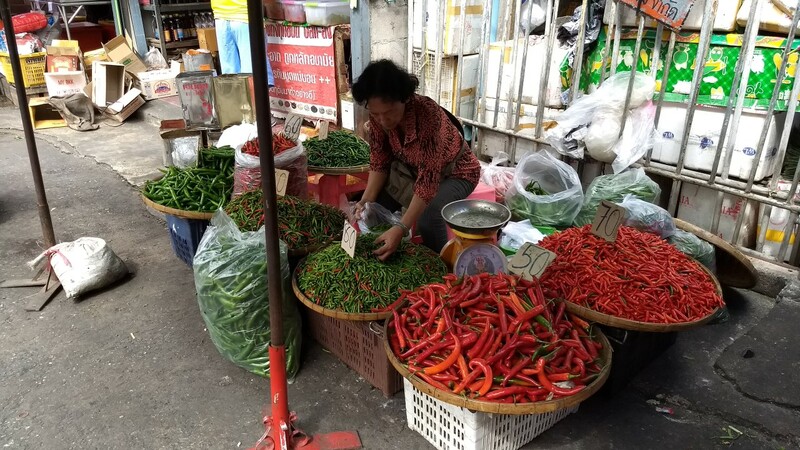 The one behind it is Nam Prik Noom, which is primarily made from very hot roasted green chilies. 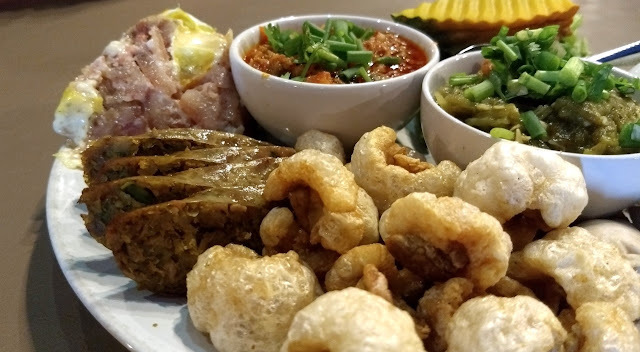 Both dips were very good with the provided veggies and pork rinds - we particularly enjoyed the green Nam Prik Noom. 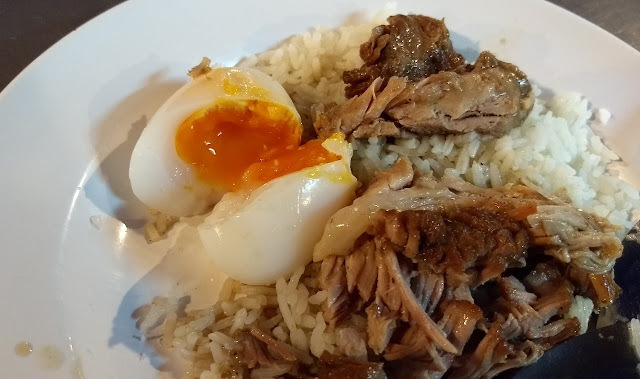 Also on the plate was some Sai Oua sausage (which was better than the version we had tried earlier) and some Jeen Som Mok Kai - a fermented pork and egg mixture that we were not particularly fond of. They were grilling this out front of the restaurant while we were waiting and the smell was irresistible, so we had to order some even though we ended up with too much food. 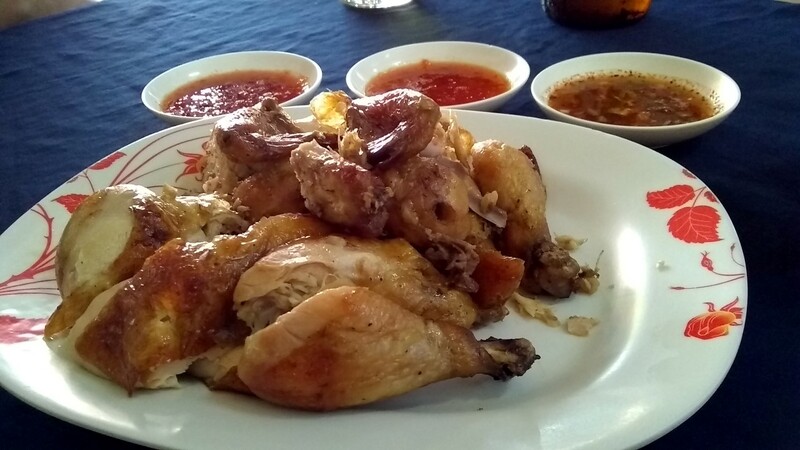 Overall it was a delicious and very interesting meal in a nice atmosphere. 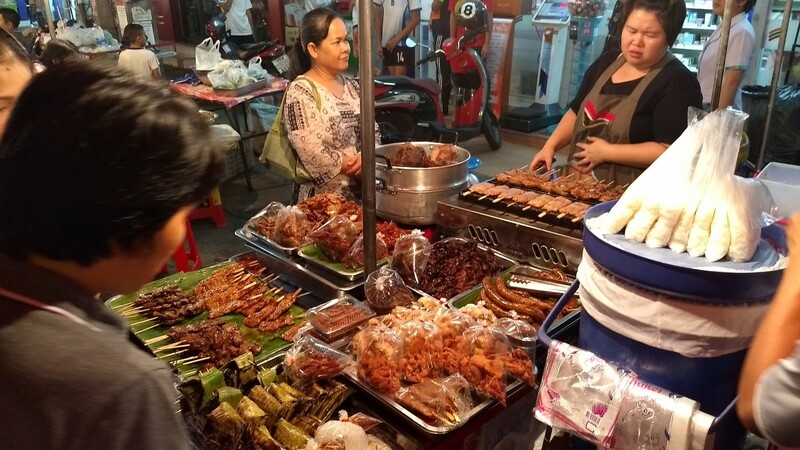 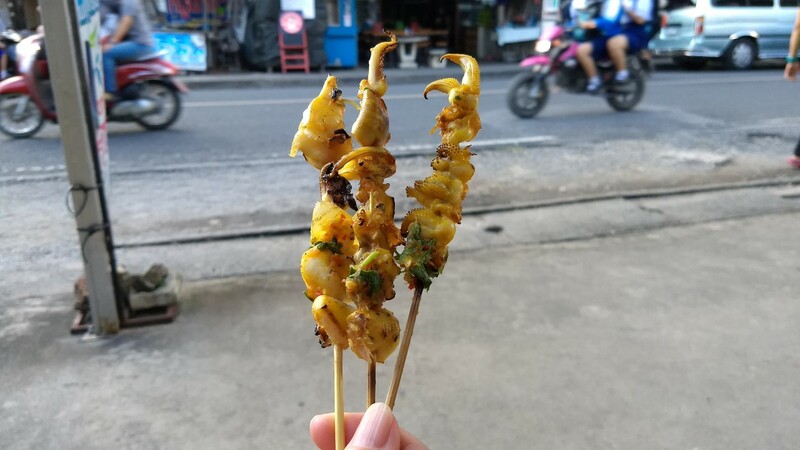 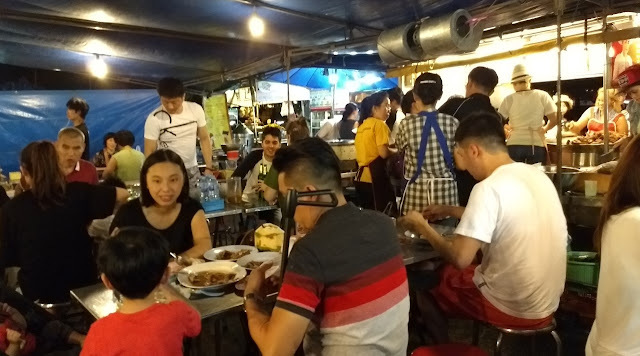 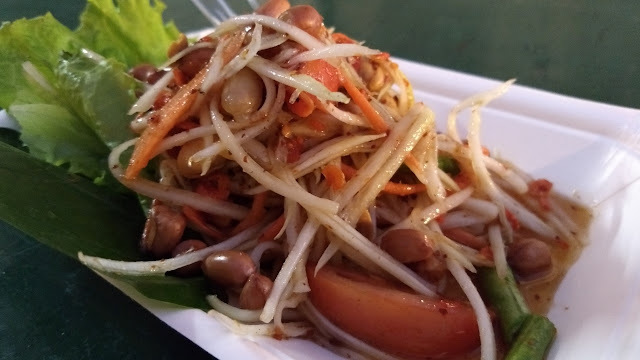 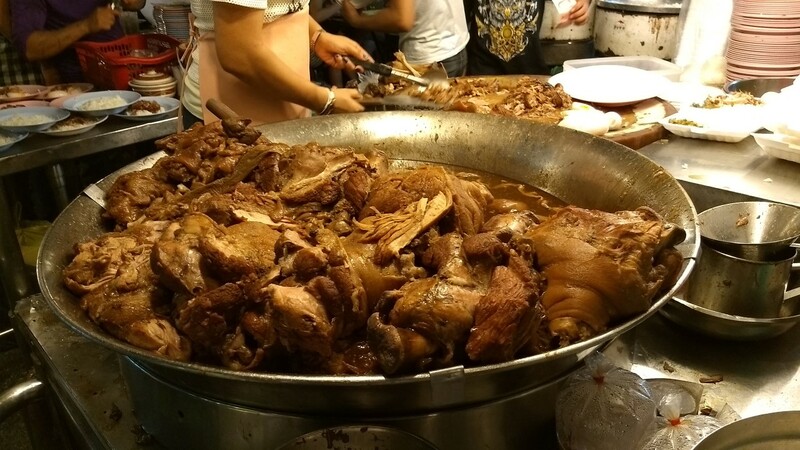 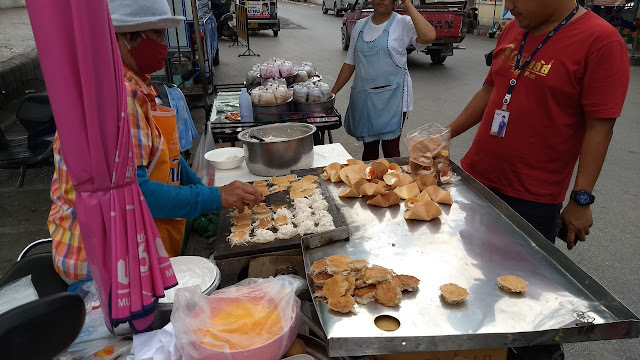 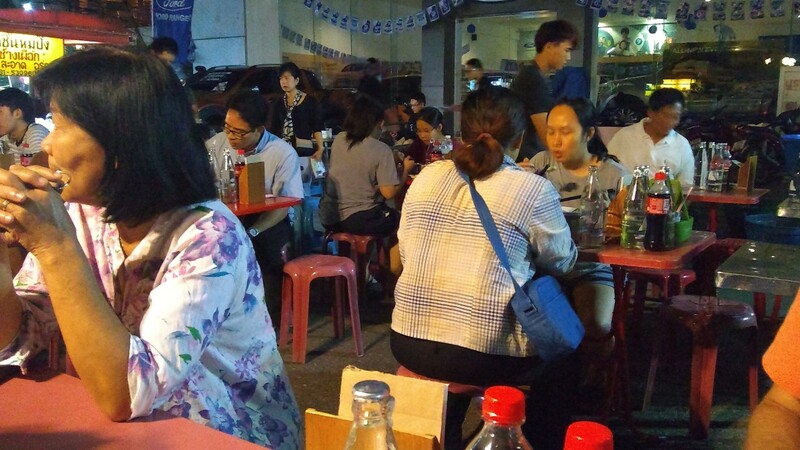 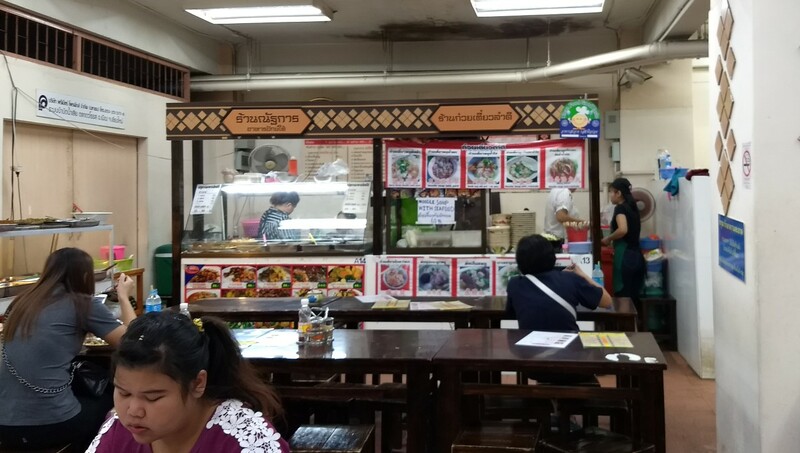 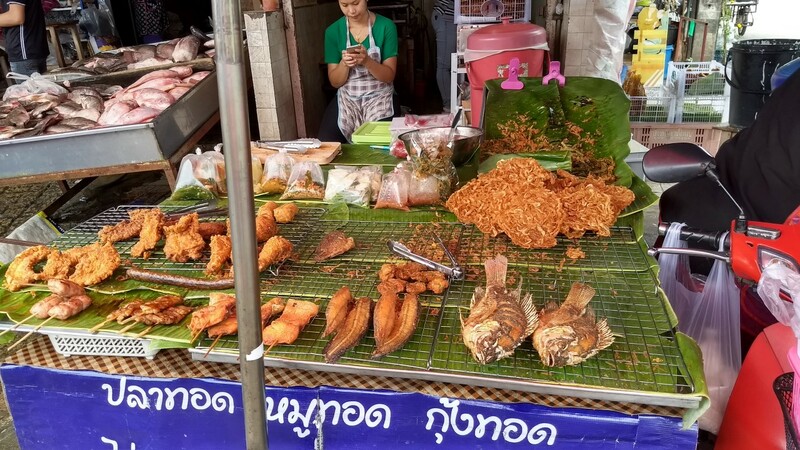 Outside of regular meals (and sometimes in place of them), we sampled various street foods during our time in Chiang Mai. 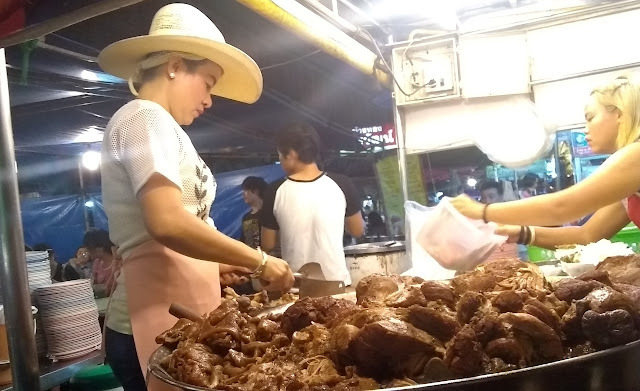 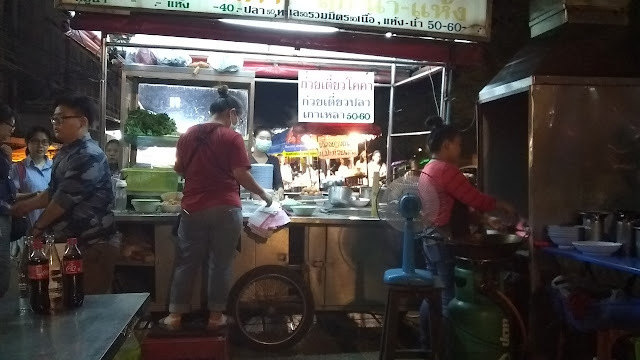 One evening, after having some beef noodle soup near the Old City south gate, we saw a stall (pictured above) selling various grilled meats. We'd been wanting to try some Thai sausages, so we grabbed some Sai Oua. On our way back to our hotel, we saw a little cart grilling up another type of sausage - Sai Krok Isan. 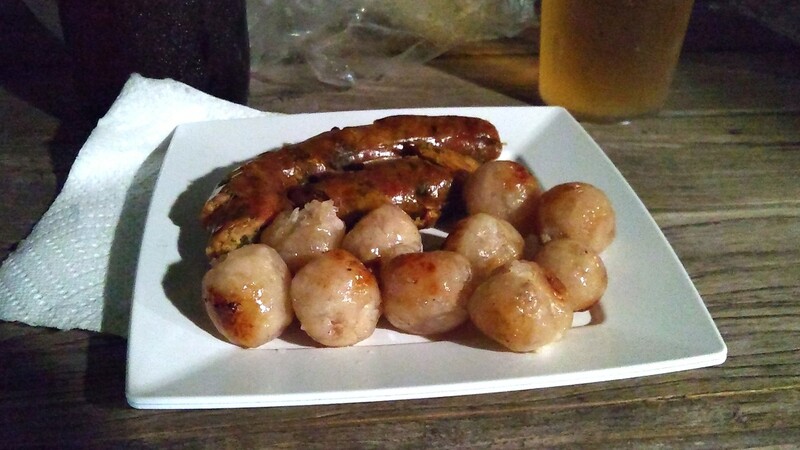 Neither sausage was amazing, but they made for a nice late-night snack. 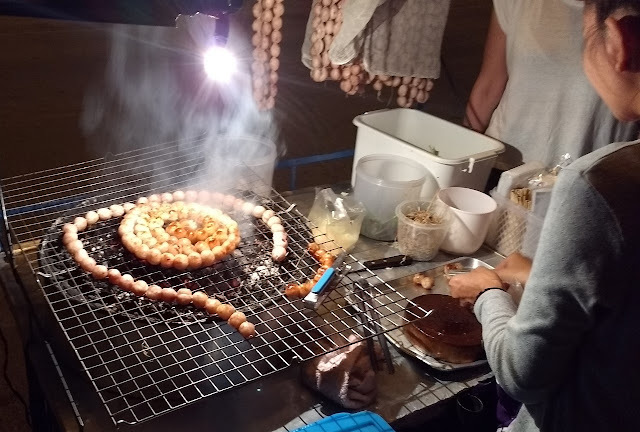 On another day, we found ourselves walking about and saw a guy grilling up squid skewers. 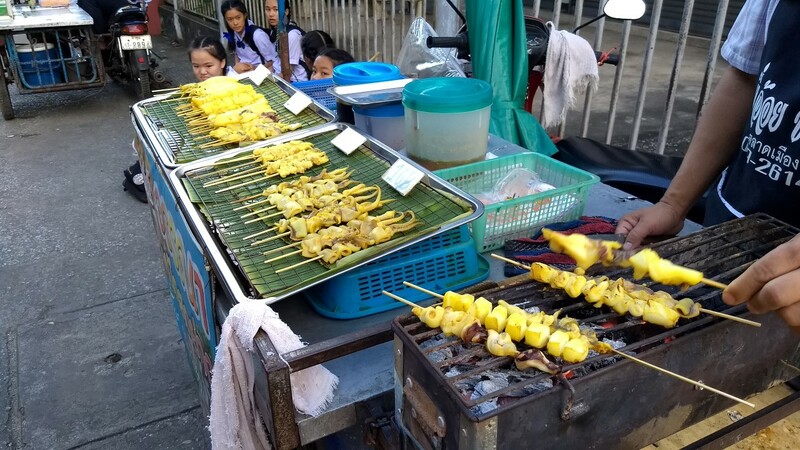 It was around the time school got out and he was being well patronized by the local kids, so we figured it was a good bet and grabbed ourselves a few skewers. 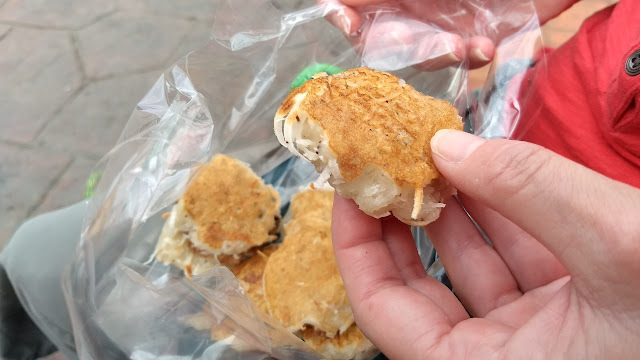 A bit chewy, but really nice flavor and a fun street-side treat. 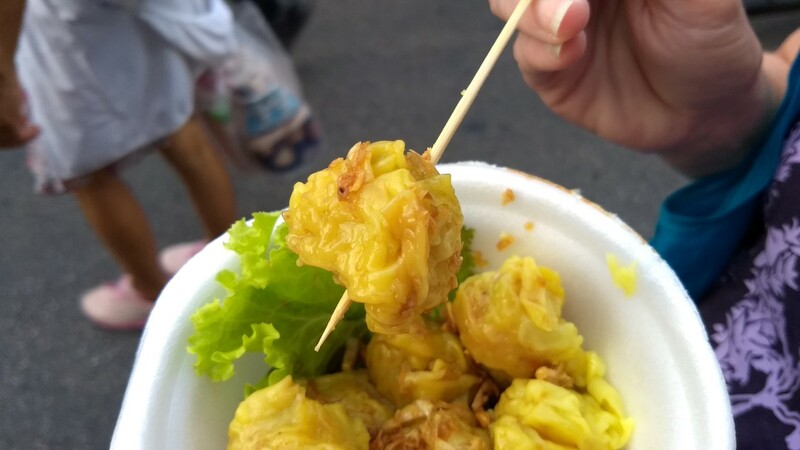 Soft and sweet with lots of coconut flavor. 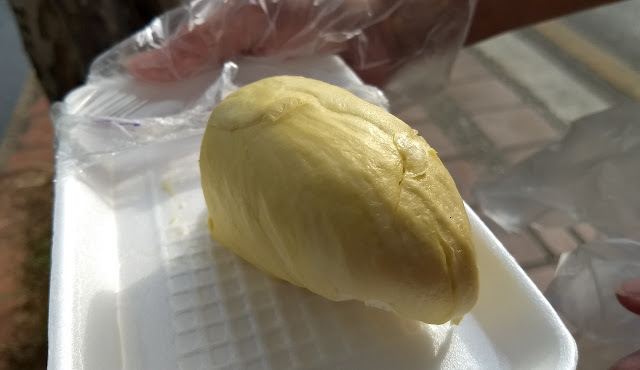 We liked it a lot - it had a really nice custard-like flavor. 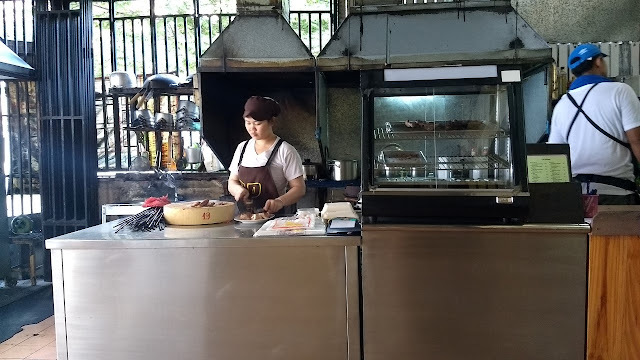 The smell was not off-putting at all. 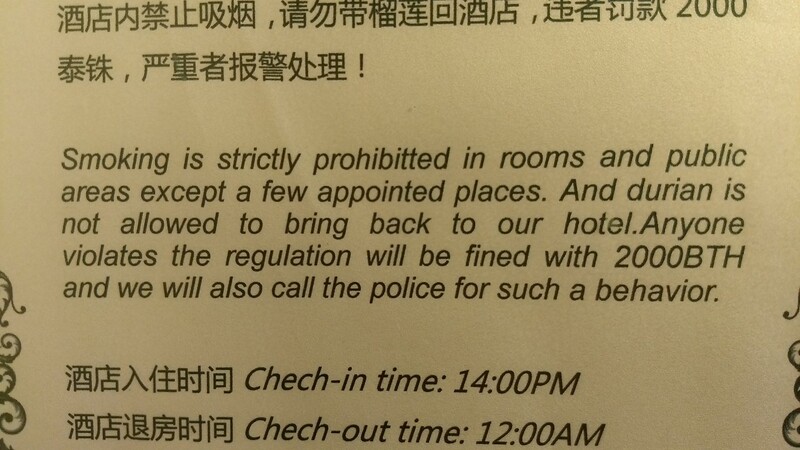 It was not durian season, though - maybe they are more pungent then? 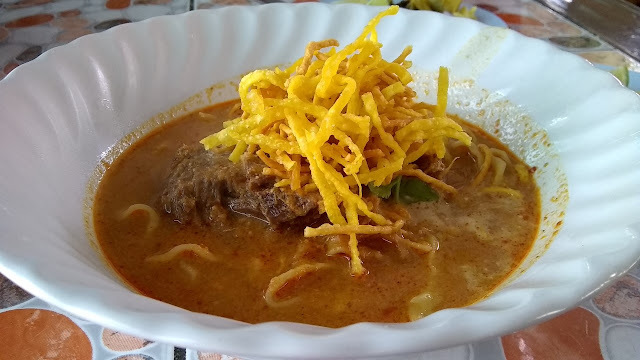 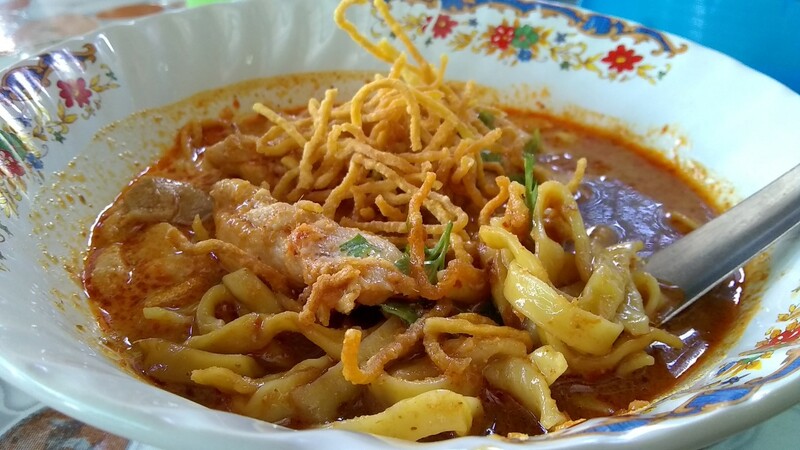 Khao Soi is definitely way up there in the running for our "best dish of the trip", due to the excellent rendition we had at Khao Soi Khun Yai. A small setup that only operates from mid-morning until early afternoon, Khun Yai makes just a couple of dishes. 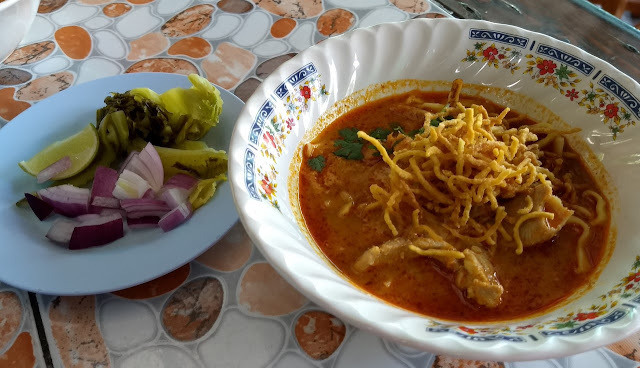 The main event (for us at least) is their Khao Soi, a deeply flavored and rich curry-like broth with pieces of chicken leg and egg noodles. 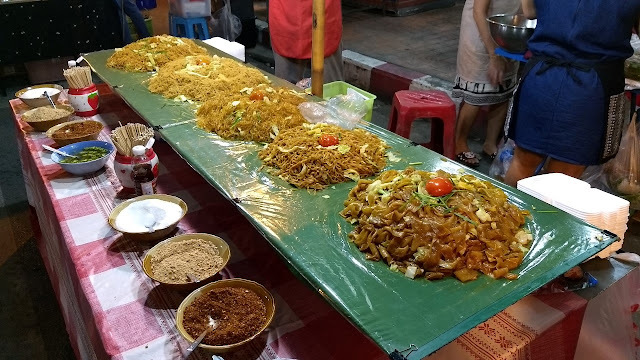 Wide egg noodles are served in the broth and a mound of smaller, crispy fried noodles gets mounded on the top providing a really nice texture contrast. 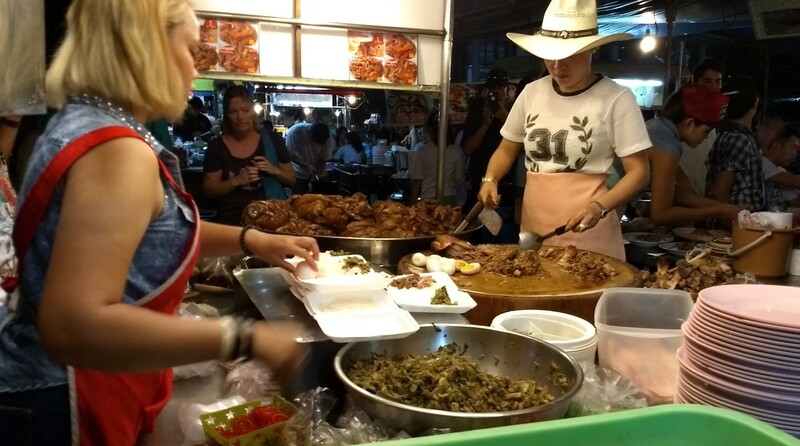 You also get some lime, shallot and pickled veg on the side to add as you please. 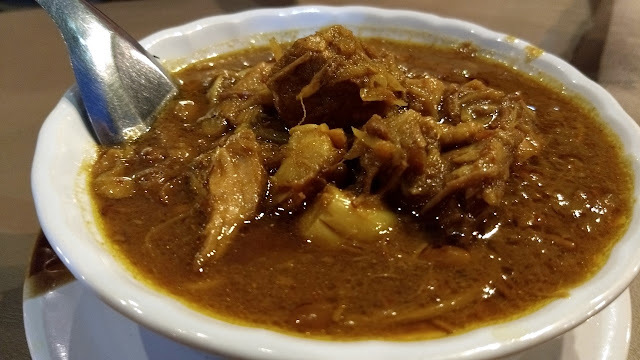 It is really all about that broth, though. 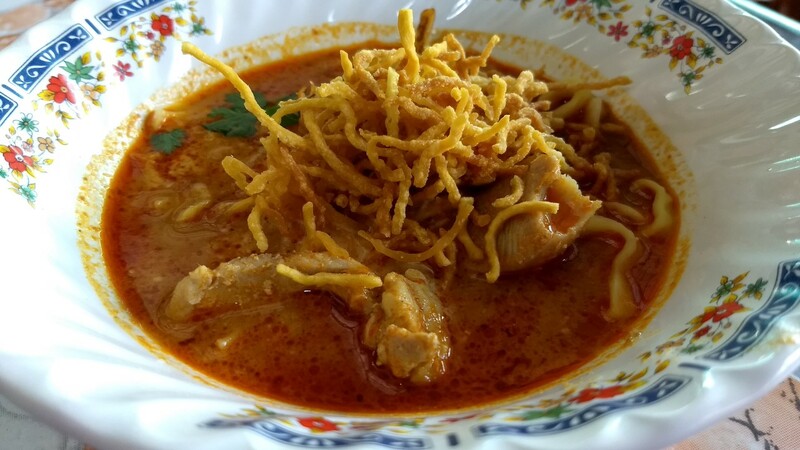 Complex, a bit spicy and immensely satisfying. 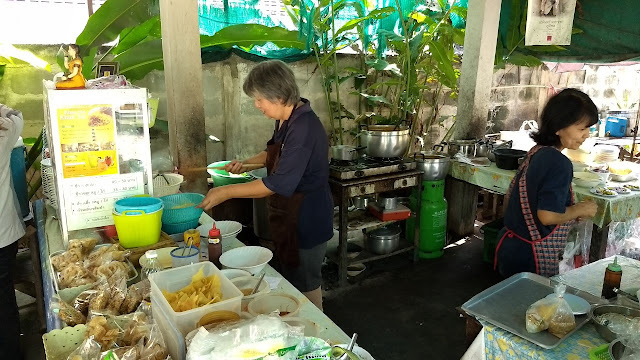 The ladies running the place were efficient and friendly. 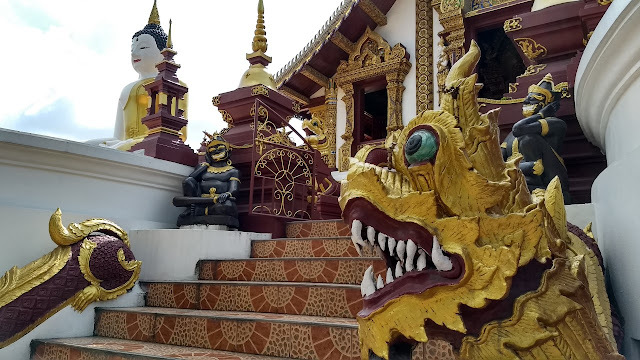 We enjoyed the entirety of the experience so much that we came back again the morning we left Chiang Mai. 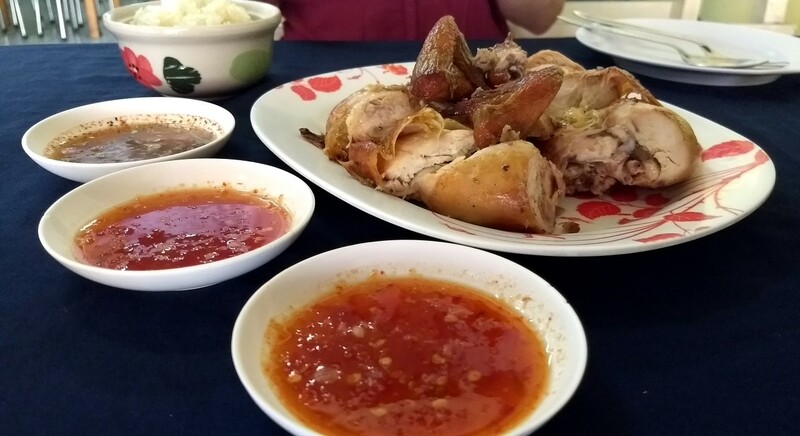 Still super tasty, but probably not quite as good as the chicken version. 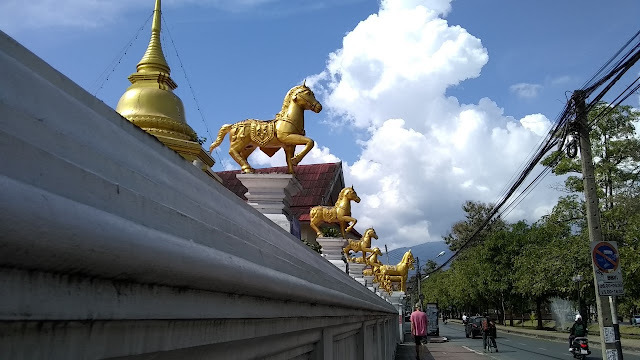 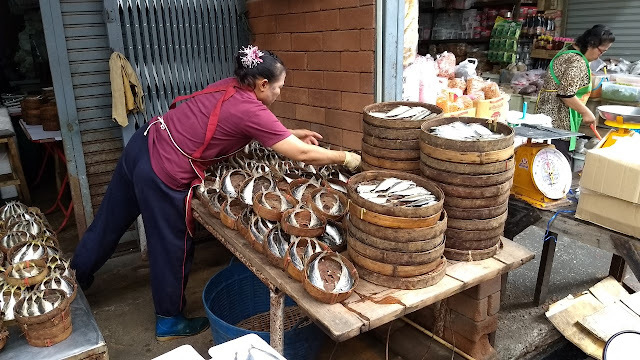 Wats are everywhere in Chiang Mai, so it is only natural that they act as a kind of waypoint system.